Well we couldn’t have that, so I went to Doctor Google and found that although the aphids were ravaging the leaves and new shoots, they wouldn’t harm the flowers or the baby beans. Phew. There were so many, though, that I felt they could damage the plants to a point where they wouldn’t thrive. Fortunately, I found an anti-aphid strategy that worked: a forceful spray with a mild soap solution stopped the little blighters in their tracks – quite literally, as the soap basically suffocates them and sticks them to the leaves, if the force of the spray doesn’t kill them and knock them off. You can find out more in this rather long but kind of nerdily charming video. Although the soap spray had good results, I had to do it a few times, because the aphids kept coming back. Anyway, the plants survived, and we got a few broad beans. 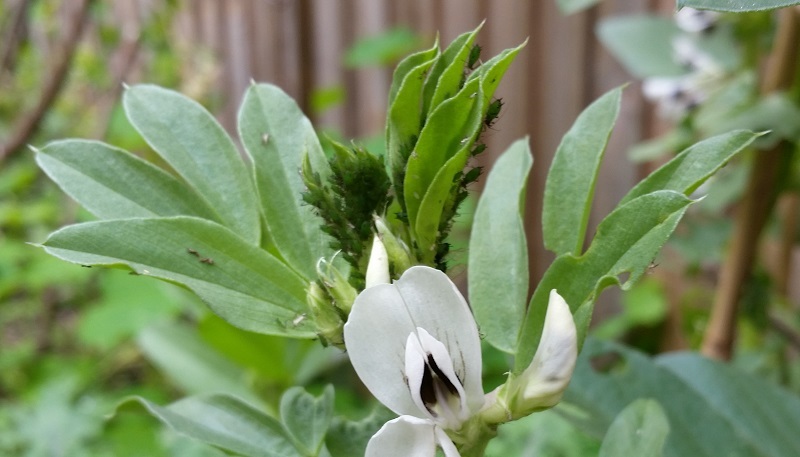 By coincidence, around the time I discovered the aphids, I also got excited about a broad bean breakfast I saw on TV. UK celebrity chef Ainsly Harriot was in Fez for his street food series, and he took time out from the pigeon pies and lamb tagines to sample a broad bean soup in the souk (market). Known as bessara, it was a very simple, creamy soup, which diners added condiments to — chilli, cumin, olive oil. It looked delicious, so I went looking for recipes. The first one I found was a Jewish variation, with sorrel. 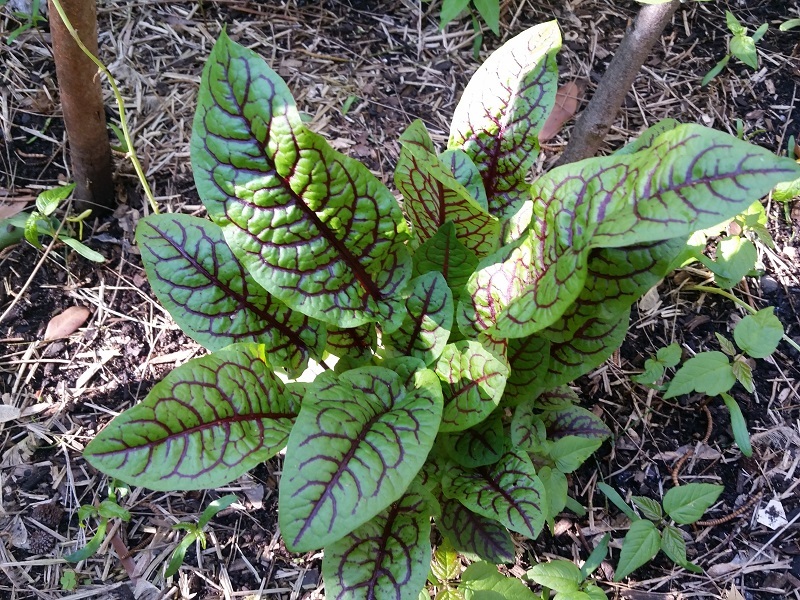 I was intrigued, because we have sorrel in our garden — a pretty, purple-veined variety. I bought it on a whim when I saw it in Bunnings, because I’d heard of it but never seen it, let alone eaten it. This recipe seems more like the bessara I saw on TV, and it also describes the cultural context for the soup. I won’t be making bessara just yet though, because you make it with dried beans, and I needed a recipe that was more springy. I found a broad bean salad, broad beans with dill and fried eggs, and fresh broad beans with couscous and coriander. They all sounded good, but in the end I just threw my handful of beans into a pasta dish. This pic shows the tasty mix of green vegies before I added the sauce — which was a kind of spinach pesto, made with assorted green leaves from the garden blended with cream cheese, garlic, parmesan, and my favourite secret ingredient, Persian feta with dill and garlic. The final dish tasted much better than it looked, so no pic. 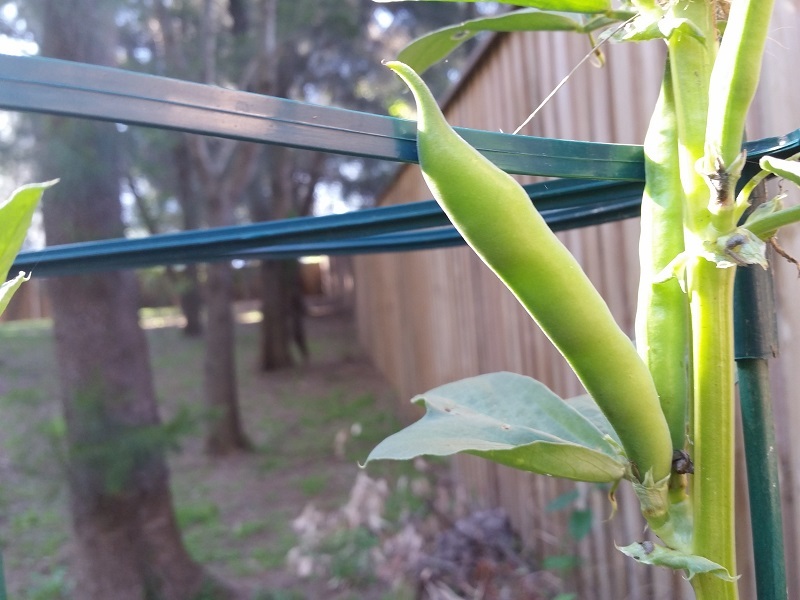 We’re not sure if we’ll grow broad beans again (although having found all those delish looking recipes I’m quite keen) because the severe lack of sunlight over winter means we won’t be planting out all the beds in future. But you never know. 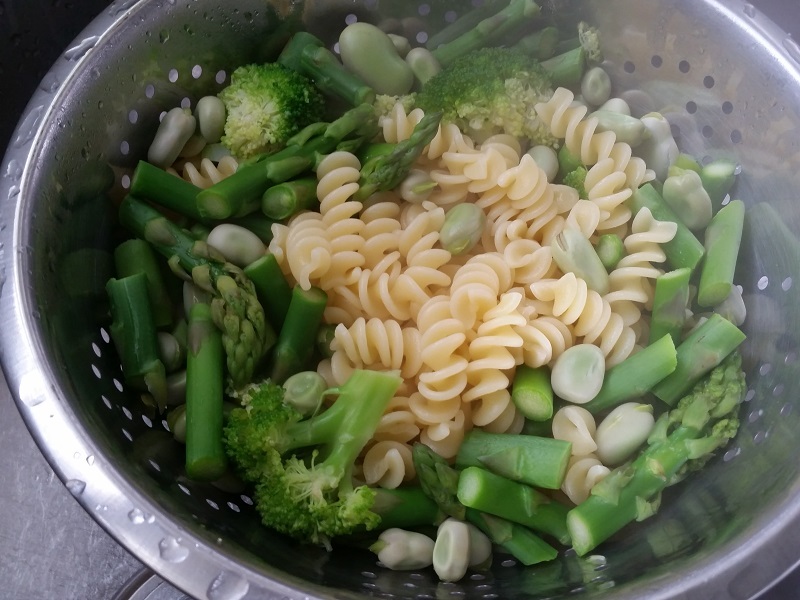 What’s your favourite way to eat broad beans?